Framed about £105 sterling plus postage. This was an excursion into fantasy. 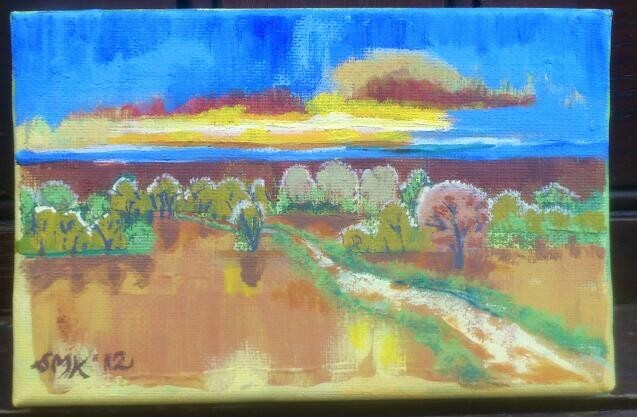 I was clearing my palette of paint and adding it to this little canvas board. The colours that emerged became very hot and lots of contrast and the red soil brought Ayres Rock to mind. It had to be Australia. I love back lighting on the tree tops when the leaves have a halo of gold. Apologies to purists, this place does not exist. If you KNOW where it is then maybe our unconscience minds do fly around in our sleep.